It makes soft fluffy snow foam, fun and simply. It saves water,saves your time and energy. it’s eco-friendly. The thick foam suds melt rods and dirty on paint, thus it reduces swirl marks and scratches. Construction Material: Solid Brass, resistant Nylon( PA material), and HDPE bottle. 1. Put PTFE tape on the brass tube (two threads), each thread needs 50cm PTFE tape. 2. 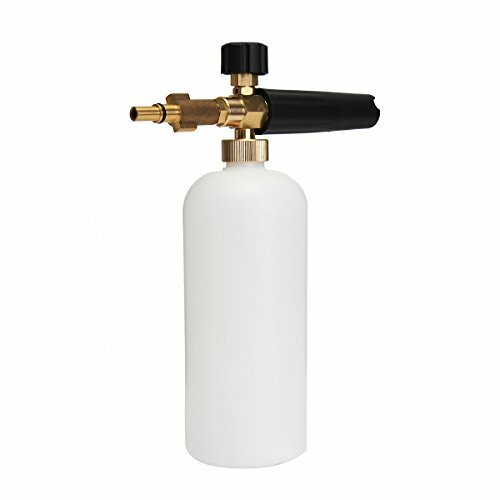 Put the fitting\/adapter with brass tube and suction tube on foam lance unit. 4. Fill fluid bottle with water (for best results, use warm water, 20% shampoo +80% water is suggested). 5. Shake the fluid bottle to mix the shampoo with water thoroughly. 6. Attach fluid bottle to foam lance unit. 7. Attach the fitting\/adapter to pressure washer gun, and you can start playing with it. View More In Foam Block Rooftop Carriers.